Health is the lifeline and safety is the backbone for any organization, by understanding this NEBOSH qualification is acknowledged by prestigious organization across the globe as a central branch that maintains health and safety at work. NEBOSH is widely known to offer vocational qualifications for safety professionals - NEBOSH International Diplomas and for those who have workplace safety as part of their day to day responsibilities - NEBOSH International General Certificate. NEBOSH International Diploma degree is highly challenging to complete, than the later, as it demands greater level of dedication by pursuer to battle this intensive course and pass out with flying colors. 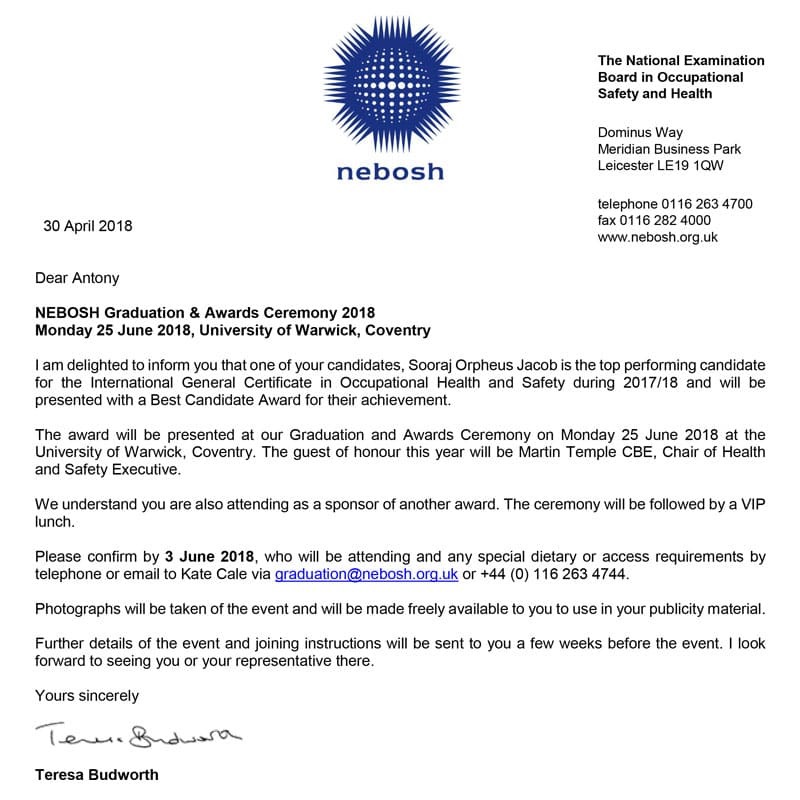 To pass through this course is definitely not a cake walk and when finally a pursuer gets through this battle, NEBOSH organizes honorary graduation ceremony every year where all the diplomats are recognized and celebrated for the high academic standard they have achieved. This year the memorable event of "NEBOSH graduation" will be celebrated on 25th June 2018 at Warwick University. Warwick University is legendarily known for hosting the NEBOSH Graduation & Awards Ceremony and with incredible happiness we share that this time, 33 of our IDIP candidates who passed out in the year 2016 and 2017 and one IGC global level topper will join with other great minds across the globe to celebrate and receive the most prestigious safety award thereby committing them to the world's greatest attempt "To Prevent Harm and Protect People". Candidates are the strong roots of NIST, and when our candidate works hard to achieve their dream we make sure to give our complete support and commitment to push them even higher to taste the fruit of success. Our support never ends when they finally reach their dream; we go beyond and help them to celebrate their dream day too. With this aim, we will offer 50% sponsorship for IDIP passed out candidates and 100% sponsorship for IGC global level topper to fly to the grand award ceremony and join the remarkable gathering of safety practitioners. When the student of NIST goes a step ahead, burns their night lamp and makes us proud at global level, we also ensure to take double step ahead by contributing for the successful conduct of remarkable event at Warwick University. To add colors to this memorable event our beloved Director of operation Ms. Priscilla Arulsamy will share the graduation podium along with other great minds across the globe and award the best candidate for the NEBOSH International Technical Certificate in Oil and Gas Operational Safety. As we march forward with full of joy to celebrate our accomplishment, we aim to fly beyond the sky and pray for such success to embrace us for the years to come.